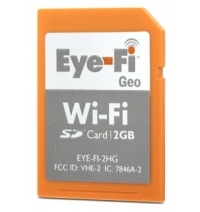 Eye-Fi is one name that pops into your mind whenever you think about a SD memory card that comes with built-in Wi-Fi functionality, but this time round the folks at Eye-Fi have gone the extra mile by releasing a new variant of their staple product, known as the Eye-Fi Geo. This wireless SD memory card will be made exclusive to Apple, where users are able to upload photos snapped from a digital camera to a computer automatically, while providing lifetime geotagging service so that when you look through those images many years from now, you’ll still be able to know where and when those images were taken instead of relying on an ever diminishing amount of brain cells. The Eye-Fi Geo card was specially built to seamlessly integrate with Mac products and applications, including iPhoto ’09 and ’08, the iPhone and MobileMe. The Eye-Fi Geo will go about its business, wirelessly uploading photos directly to a folder on your computer or Apple’s iPhoto gallery whenever they they arrive automatically geotagged with location information about where the image was captured. This tight and seamless integration with Apple products and features will see iPhoto ’09’s “Places” allow users to search and sort photos by location using geotags from the Eye-Fi Geo card. Apart from that, users are also able to upgrade their Eye-Fi Geo card to share images online at MobileMe or over 20 other popular photo sharing and social networking sites as long as one is willing to fork out a $9.99 fee each year. According to Jef Holove, CEO of Eye-Fi, “Apple users want simplicity and an effortless user experience, so it’s not surprising that a significant number of our users are on Macs. The Eye-Fi Geo is the perfect companion for iPhoto’s new ‘Places’ application to pinpoint photos on a digital map so memories are displayed in a richer, more meaningful way.” If you’re interested in the 2GB Eye-Fi Geo card, it can be yours at Apple stores and Apple.com for $59.99.